Located just a stone's throw from the Georgia state line, the Omni Amelia Island Plantation Resort nestles itself into 1,350 gorgeous acres among Northeast Florida's famous landscape. Here, visitors truly experience Old Florida, where live oaks are festooned with Spanish moss and "laid-back luxury" defines the lifestyle. On a couples' getaway, there’s a fair share of stimulating things romantics do together: exploring nature, horseback riding, kayaking, playing golf, canoeing, and browsing endless rows of Amelia Island shops adorned with aromatic chocolate to beach attire. But assuming the excitement gets to be too much, Liz Hutto, Spa Director at Omni Amelia Island Plantation, offers the ultimate full-day couples spa experience. It is here, in a breathtaking celebration of natural wood beams and gender neutral palettes that couples come to revive romance and respite in surroundings as primordial as they are pampering. And as regimented as today’s couples tend to be, here schedules promise only relaxation and much-needed opportunities to unwind together. 7am: A bright and early start next door at the adorable Marché Burette gourmet market is a must. Here gastronomists delight in a variety of ready-made breakfast items, and a dizzying array of packaged gourmet goods, including the island's famous Amelia Toffee, crafted with unique ingredients like peppers, coffee, and bourbon. Marché Burette’s wine selection also winks for attention, stocked for romantic post-spa stargazing. Light breakfast selections include seasonal fruit with greek yogurt, or if you're feeling a little more decadent, choose one of their assorted house-baked pastries with a delicious latte. 8am: It's time for a private yoga session in the Spa's treehouse (and it's every bit as adorable as you'd imagine). The journey to the treehouse is delightful, as well. You'll enjoy rustic wooden walkways and heavy, almost wild, landscaping, which show a healthy respect for the natural surroundings when the facility was built. Drink plenty of orange-infused ice water to refresh and hydrate both before and after your yoga session. 9am: After yoga, a relaxed, loose vibe calls for a change into plush spa robes and a light snack of healthy trail mix, along with cucumber infused water. Then it's time to settle into the couples’ massage room, with large doors allowing in a welcome dappling of natural, golden light through lush greenery. Here, you can enjoy a deep tissue sports massage - perfect for releasing everyday tensions - or the Spa's signature Lomi Lomi massage, inspired by the gentle rhythms of the Hawaiian hula. 10am: After the massage, the private couple’s relaxation area is a must for a glass of champagne and reflection. The room is intimate, opening out into a thicket of green, peppered with the sounds of local birds. 10:30am: It’s time to separate for facials: Hutto recommends the Anti-Aging Facial for ladies (youth-restoring peptides, antioxidants, and firming collagen, followed by a mineral micro-dermabrasion and wrinkle-filling serums) and the Vitality Facial for men (a customized, deep cleansing, hydrating facial infused with black, white and green teas and antioxidants). 11:30am: With the glow from the facials still fresh, it's now time for a couple's pedicure, a requisite for Florida living and playing, since the water, sun, and sand tend to take a toll on the feet. Omni’s Paradise Feet Treatment starts with a ritual cleansing; then feet are moisturized, while tired legs enjoy a revitalizing massage and masque. 12:30pm: Continue to unwind in the Spa’s open meditation area. This glass-enclosed room looks out over a courtyard of apparently unspoiled Florida landscape. Here guests close their eyes and take in soft music or enjoy wildlife sightings just outside, from egrets to herons, bald eagles, nesting doves, and colorful frogs. 1pm: Being pampered can work up a healthy appetite. Consider ordering in lunch to the couple's meditation room—or, if a little more sunshine is desired, dine on the Spa's wrap-around porch, complete with rocking chairs and a view of the lake next door. With a little notice, you can even arrange to enjoy lunch in the treehouse—the view alone is worth it! 2pm: The "Seaside Sensory Journey", Omni Spa’s signature service, is a luxurious, 80-minute treatment developed by Hutto herself with her eyes closed (to develop a true exploration of the feel, scent, and way each product affects the body). This is certainly one you don't want to miss. First, you'll be treated to a cooling, silky Japanese bodywash, followed by a white peat exfoliant, which slowly increases body temperature. The body is then patted dry, and as you enjoy a cup of herbal tea, the therapist prepares the table for the next part of the treatment. A formulation by Red Flower is spritzed into the air, changing its molecular structure to create a negative ion environment (much like that fresh feeling right after a thunderstorm). The treatment will wind down with a wild Kinmoxei lime oil massage, followed by an application of soft camellia creme. 4pm: Back to the couple's meditation room for more post-sensory-journey relaxation. Ordering the tea service allows time to sip and enjoy with a book or while enjoying view. To maintain that fresh air, a bottle of the Red Flower spritz keeps the room as tranquil as the last treatment. 5pm: While the sun slowly sinks in the sky, the long, lazy shadows begin, and the brilliant gold afternoon light begins to take shape. This is the perfect time to stroll together and look for wildlife, enjoy the landscape, or simply let the sun warm faces while pondering things larger than life. Slow is the way. With loose, fresh, rejuvenated bodies, romance is assured. 6pm: It's time to prepare for evening cocktails, followed by dinner at one of the Omni's many restaurants. Try one of the spa's individual steam showers to freshen up for an evening together. No visit to Omni is complete without reminders of the peace and romance of the island getaway. The Spa Shop offers regional brands from boutique makers, including Zent's, a favorite of Liz Hutto. She recommends the Sun fragrance, which is featured in the line's soaps, lotions, and bath bombs. Be sure to load up on the "spritz" from Red Flower and harness the calming power of the ocean in any environment. 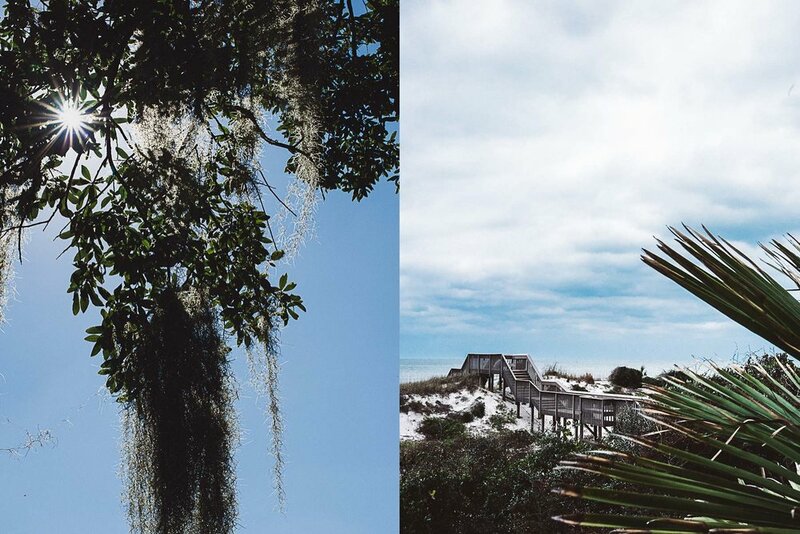 You'll find magic here at Amelia Island among the ancient landscapes, with their fresh, earthy scents and scenery. It’s here couples walk, hand in hand, melting from soothing lotions, taking in the sky, heartbeats, and the moments that make life an adventure worth taking together. And unlike spas meant for her only, Omni is made for love of the environment as much as it is for the couples strolling among its moss-lined trees. Special thanks to models EllieAhna Stewart and Darian Williams. EllieAhna's hat and jewelry courtesy of JAshley Boutique.